I was passing through Lime Street last night, and I noticed some posters for Merseyrail's new publicity campaign. 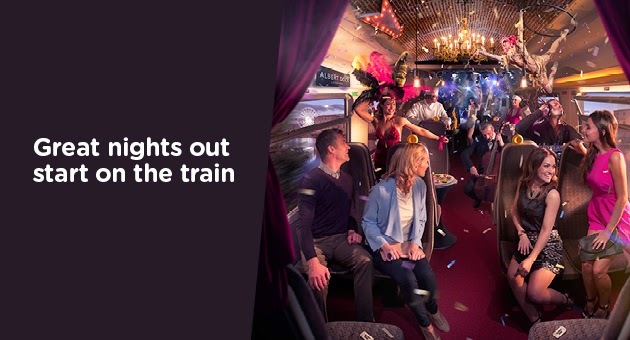 It's there to suggest you use Merseyrail to go off into town and enjoy yourself, I know, but my first thought was Jesus, that looks like hell. I don't want elaborate dance performances when I'm off into town. I want a nice quiet time where I can perhaps chat to my friends. I don't want a trapeze artist whacking into the back of my head. If these are the kind of features we can expect from Merseyrail's new trains, count me out. With the possible exception of the chandelier. Still, it might just be that I'm a miserable old stick in the mud. After all, I've never been on a night out so wild and crazy that I've gone home with only one shoe. You'd have to be absolutely rat arsed to not notice that suddenly you're an inch shorter on one side. Kudos to you, unidentified reveller. I hope you've got all the Anadin you need this morning.